The inextricable link between liquid consumption and urinary tract disorders is well-known to women who suffer from incontinence. What may be less obvious, however, is that quality can have just as much of an impact as quantity. 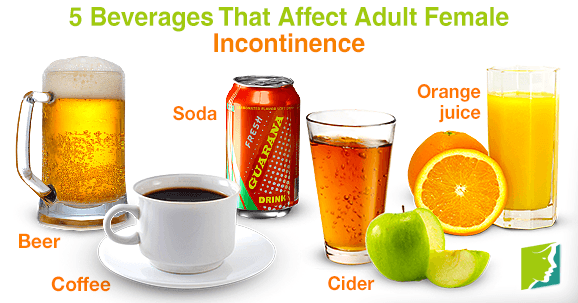 Read on to learn more about five types of beverages that should be avoided when battling incontinence. As with many health conditions, including menopause symptoms, ingesting stimulants such as caffeine can exacerbate the problem and should be avoided whenever possible. Incontinence is particularly impacted by caffeine in that it causes the bladder to fill up quickly, urging sufferers to go more than would otherwise be necessary. Experts recommend that women who suffer from incontinence stop drinking coffee and other caffeinated beverages so as not to interfere with the treatment's progress. Soda is a health offender for several different reasons, but the main quality of this drink that affects incontinence is actually carbonation, which is known to contribute to bladder leakage. Even without caffeine, soda can easily exacerbate incontinence. It also has an indirect effect in that its average 39 grams of sugar per can lead to weight gain in the long-term and put more pressure on the bladder. Soda intake should be avoided or limited as much as possible. To lessen the effects of incontinence, it is best to avoid foods and drinks that have high levels of acidity, which can aggravate symptoms and lead to overall discomfort. Common fruits used for juices - such as orange, apple, grape, and tomato - are naturally acidic, and their intake should thus be limited in both raw and processed forms. Smoothies that contain banana or avocado, however, can be interesting and delicious substitutes. A holiday favorite for many during the winter months, hot apple cider is often laced with sugar and spices. This may make for great nostalgic flavor, but it also has the potential to worsen symptoms of incontinence, particularly for women going through menopause. Alcoholic beverages are notorious for increasing the need to urinate, and beer is no exception. After alcohol is consumed, the body stimulates the bladder to help the body reduce alcohol levels in the bloodstream. In addition, barley itself works as a mild diuretic. Beer tends to be high in fat and calorie content, resulting in excess weight that can press on the bladder and cause even more frequent trips to the bathroom. Though you may feel a loss of variety in your choice of beverages, the benefits of reducing these types of drinks are significant. Trading things like soda, juice, coffee, and beer for glasses of water will not only have positive effects on incontinence but will also show immediate improvements in your overall health. Follow the links below for more information about how to deal with incontinence during menopause.